This story is set in India. Timber arrives home his friend Harry calls him into the bedroom. Harry doesn’t look too good. He isn’t ill though, a deadly snake has found its way underneath the covers with him. In fact the snake, a krait, is still lying on the poor man’s stomach. Mr Klausner has invented a very special machine. It allows him to hear sounds that are so high pitched that they would never be, in ordinary circumstances, audible to the human ear. Perhaps, though, there are things that it is best to remain in ignorance about. George isn’t comfortable around women, but they are always chasing him. Even the fact that he is a man of the cloth offers him little protection. Perhaps if George’s mother had lived a little longer than she did things would have turned out differently for him. After already having lost all three of her children within the last 18 months, a mother prays that the child she has just given birth to will be stronger than its siblings were. It is sound advice that one should never pick up hitch-hikers. This is the story of a man who doesn’t take that advice and the hitch-hiker that he picks up has a rather unusual talent. This is the story of a mother and daughter’s encounter with an old man in the rain. The man has a problem. He also has a particularly fine umbrella. In the first Tales of the Unexpected book there is a character called Mr Botibol (“Dip in the Pool”). Botibol is such an unusual name that I thought that this story must surely be about the same person, but that doesn’t seem to be the case. The Mr Botibol in this story is such an extremely strange looking man that it cannot be the same person. Mr Botibol is, as well as being strange looking, a very unhappy man. In the end he tries to find happiness in music, but in a rather strange way. Not a story of revenge, but a story of two people that come up with a rather unusual idea to make some money. At less than 4 pages long “The Butler” is the shortest story in the book. It is a highly entertaining story though. Two things came to mind when I read this little gem: taste is something that no amount of money can buy and people should be careful who they trust. My favorite stories are “The Umbrella Man” and “The Butler”. Both are subtly amusing and quite light-hearted reads. “Poison” is one of the darkest tales in the book and will probably terrify any reader who has a fear of snakes, but More Tales of the Unexpected contains such a varied mix of stories it offers something suitable for most tastes. Readers who are considering buying this book because they are fans of the Tales of the Unexpected TV series need to be aware that this book does not contain all of the stories from the second series. There are sixteen episodes in the second series of Tales of the Unexpected, but Dahl only wrote nine of them. The other seven stories, although deemed of a suitable nature for inclusion in the TV series, were based on the work of other authors. 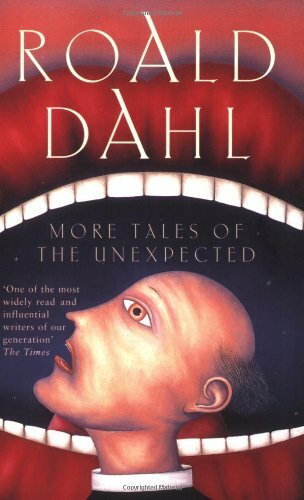 This book contains only the stories written by Roald Dahl.